A Git-versioned project keeps three versions of a file. The version in the working directory is the one you work on. Once the file has reached a state that you want to keep, transfer it to the staging area using git add file and continue working on the version in the working directory. You can repeat this process as often as you like. However, you always overwrite the previous version in the staging area. There is exactly one version for each file in the staging area. Any following commits adopt this latest version. The version in the working directory is irrelevant. Figure 2 shows two different versions of the file project.txt, one in the staging area and a second in the working directory. The repository contains the third version. Figure 2: Two versions of a file and possibly instructions for working with them. Git sometimes gives hints when executing some commands. The hints often refer to how you undo a particular action. In addition to the general manual (man git), the installation comes with several specific manuals (see Table 1). 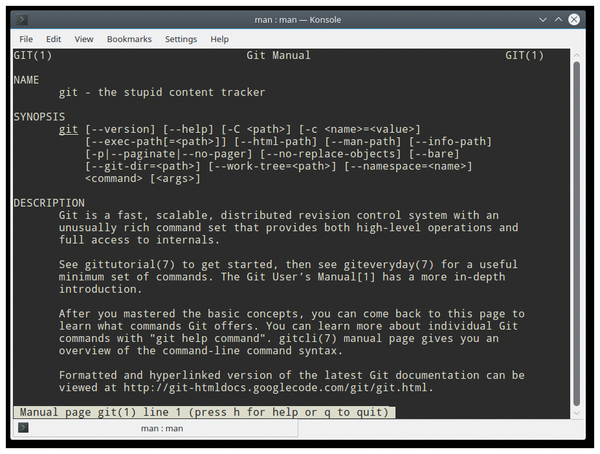 If you call man git, you will find an overview of the subcommands, including a short description in the GIT COMMANDS section (Figure 3). Figure 3: The man git man page gives you a quick overview of git commands. Further documentation is located in /usr/share/doc/git. The scope of the documentation depends on the distribution. Fedora comes with a manual for users, user-manual.html, and a how-to, howto-index.html. For help with a subcommand, add the subcommand with a hyphen. For instance, man git-add brings up information on the git add command (Figure 4). Figure 4: In addition to a page with general information, many distributions also have pages explaining the various subcommands. All distributions used in the test support automatic completion of the Git commands and their options using the Tab key. The excerpt from Listing 4, Line 2, shows the output after the command git a followed by pressing Tab. In this case, several options appear. 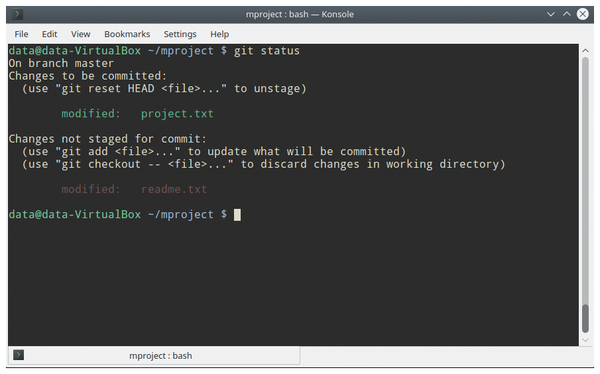 The call to git --help (Listing 4, Line 3) shows an excerpt from the overview of the Git commands by task. The project.txt file changes as the project progresses. You copy and save new versions with the commands add and commit. The git status command shows the status of the files in the working directory. Listing 5 shows the status of the file after the git add project.txt command switches from changes that are not flagged for a commit to changes that are flagged for commit. $ git commit -m "new line inserted"
The git add command lets users specify patterns for files and directories and other options. You can use git add -u to move all modified files entered in the index into the staging area. Table 2 shows the commands used so far.